Cut the bacon into diagonal strips and slice or dice the onions. Fry the bacon and onion in a pan. Remove and brown the tenderloin slices for 1 min. on each side over high heat. Add the water. Return the onion and bacon to the pan. Add the mushroom slices and peeled tomatoes with their liquid. Cook over a low heat for approx. 15 mins., covered. Add the cocktail sausages to the stew when there is 5 mins. left of the cooking time. Thicken the gravy if necessary and season with salt and pepper. 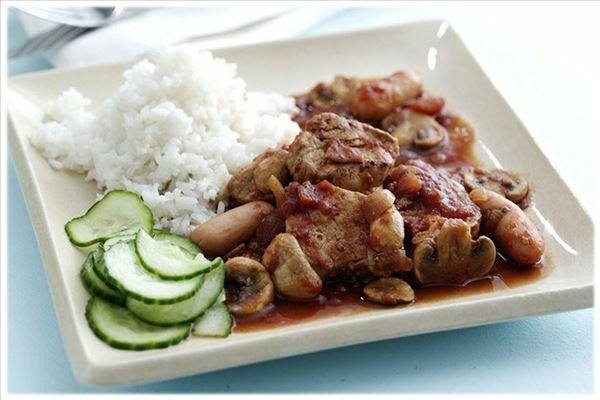 Serve the stew with the rice and cucumber salad. The cucumber salad can be made of 1 cucumber, 1 dl vinegar and 1 dl sugar. Finely slice the cucumber. Blend the ingredients for the marinade and season with salt and pepper. Pour the marinade over sliced cucumber and leave to infuse for 1-2 hours.